We've been making beds in Fortress Wallaby for months now. Fortress Wallaby is my fenced vegetable garden which aims to protect my vegetables from the local wildlife like wallabies and wombats. The beds are edged with wood from the property - some logs from a fallen bridge, some from fallen limbs and others from trees we felled for fire protection purposes. The beds are looking amazing with their chunky, rustic, organic edges of local hardwood. 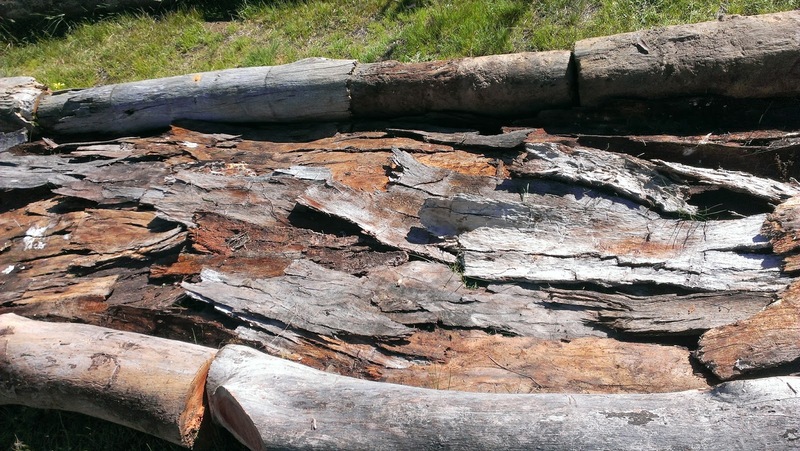 The Lad and the ute have put in a mammoth effort to cut and move the huge pieces of timber. 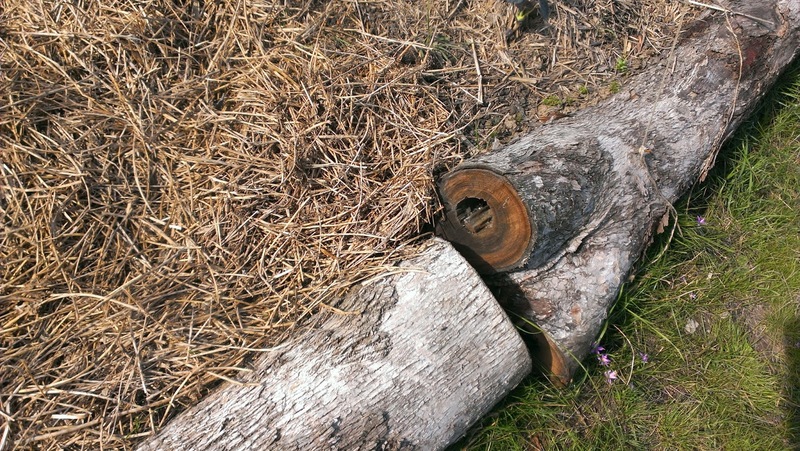 While beds are in lines, the beds wiggle with the twist in the trunks. I'm hoping that log-loving creatures take up residence in the holes that the cut wood exposes. I am hoping that more bed edges start growing lichens like these. The wood edged beds take ages to fill with things that will eventually become soil. 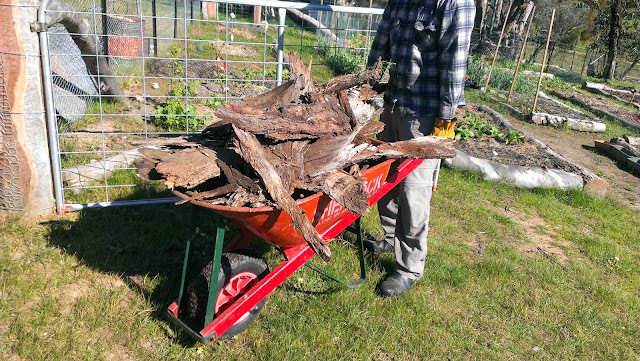 I have flattened cardboard from the boxes discarded by local shops, there has been wheel barrow loads of weeds hand pulled from the pasture and been ute-loads of sheep manure from under the shearing shed and from a neighbour's horse yards. And today there has been bark - big thick sheets of bark from our native hardwood trees. 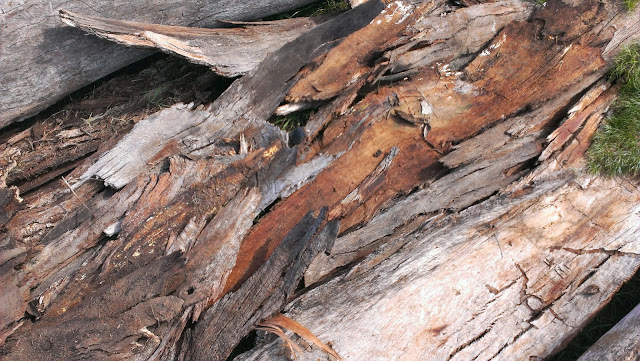 It has been my custom so far to pile thick layers of cardboard in the bottom of the beds but it occurred to me that the bark that's shed from dead trees was very similar but perhaps even better than cardboard? 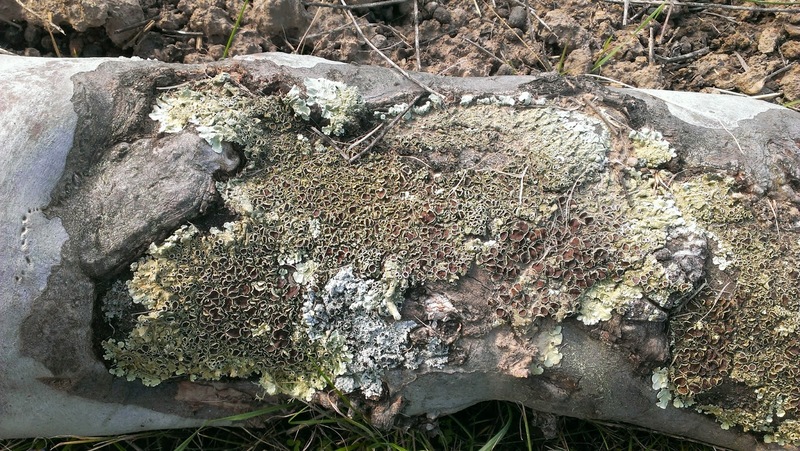 It is thick, it keeps the light out and thus easily kills the grass below, it holds water very effectively and is already loaded with lichens and fungi that will help break it down and add to soil life. Cleaning it up from around the bases of the trees close to the house aids our fire protection and there is no tedious removal of sticky tape as their would be with the cardboard boxes. I'm hoping I am on to something... does anyone else use this kind of material in their garden beds? I use bark as a base for new garden beds, and on top of the mulch to stop the chooks flicking it everywhere. Fantastic. I would worry about putting this bark on top as a mulch. the pieces are very thick and big and I am sure that it would limit where rain goes onto the bed. I could break it up I guess? Thanks Ms L. I cant wait until the beds and plants start to naturalise - you know when the parsley starts to self seed and when the nasturtiums spill out of their bed. Lots of work making good use of what's around. Always curious though about using weeds? How come you don't get seeding and infestation of the beds? I hope not... but really, if you pull up the weeds before they flower and seed they you aren't bringing seeds into your beds, just greens rot rot down. 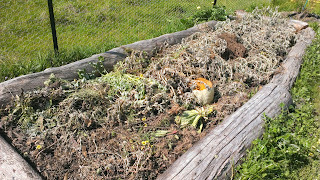 I have one bed that has a mass of thistles in the base and that bed is going very very well and no thistles coming up. I love your rustic raised beds and I applaud your reuse of all those available materials. fantastic! Oh thanks Michelle. 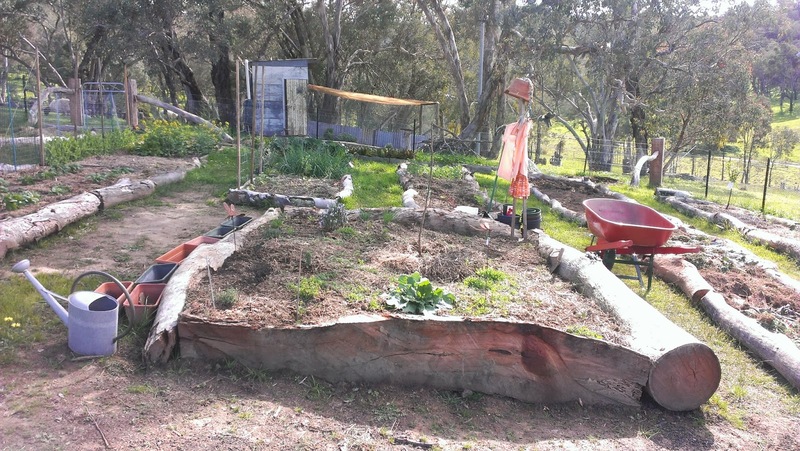 Our Australian bush environment lends itself to a rustic chunky approach to the veg garden I think, rather than a pretty set up. I cant wait till it goes a bit feral! Wow- your beds are so pretty! Great job! Oh thank you , I am not sure that they are pretty but they are rustic! Gorgeous beds. 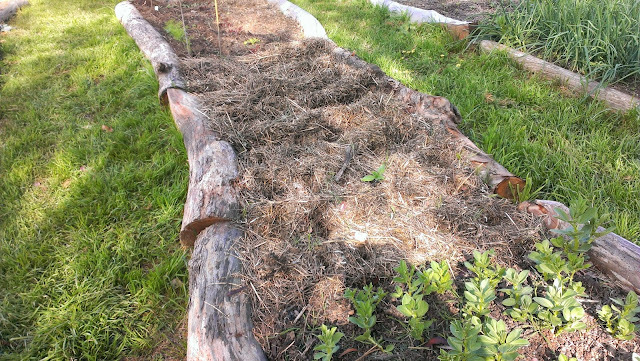 I would be a bit hesitant about using bark on the top of the beds in case of nitrogen drawdown. Perhaps you can break it up and mix it with the high nitrogen from the chookies to break down a bit before adding it to the top. I am quite jealous of the amount of garden beds. So much food spaces. I love your rustic beds - and sooo many of them! Fabulous. I use cardboard to block out weeds too and it works fairly well. I imagine that the bark will work even better in the bottom of the bed. Not sure about the top - maybe try it on one bed to start with (you've got heaps to choose from!)? Just as an aside, I'm having a go at growing okra this year, just for something different. I have no idea how they will go and almost no idea how to use them but you've gotta give things a go, don't you? Well i am really impressed by your work. Nice addition you have made.